In today’s volatile and uncertain market, risk is often a key component of investment decisions. Mitigating risk could mean investing in traditional “low-risk” asset classes like cash or fixed interest; however, with current low interest rates and sluggish economic growth, investing in these asset classes may severely limit capital growth. Worse, it may actually expose you to the unintended risk that a lack of diversification can bring. At the centre of each Smartfund is a risk-graded strategy managed by Smartim. 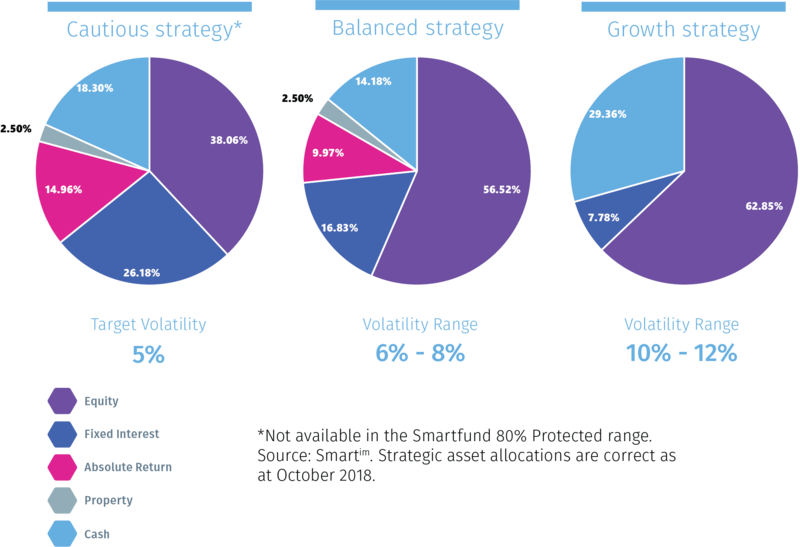 Each strategy has a specific risk profile and invests in a carefully constructed blend of asset classes. Smartfund is available in three different currencies, GBP, EUR and USD. Historically one of the best ways to achieve higher investment returns over the long term has been to invest in equities; however, though equities can provide higher returns they are also higher risk. Including other asset classes in your strategy can provide the best risk-adjusted returns. At the centre of each Smartfund is a risk-graded strategy managed by experts at Smart Investment Management (Smartim). 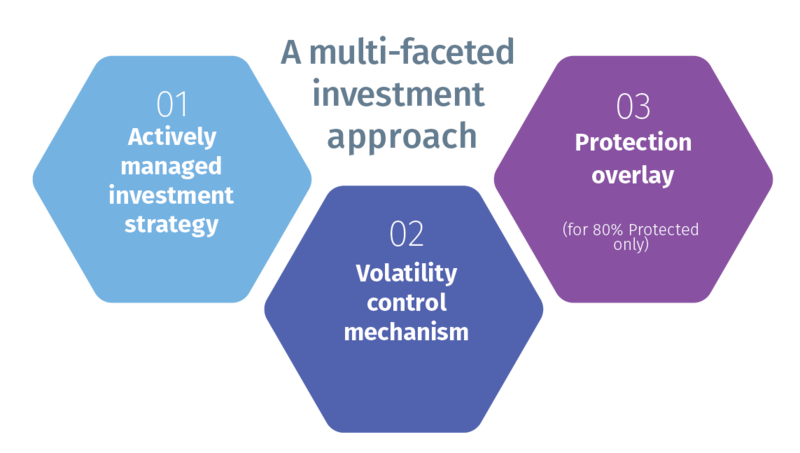 Each strategy has a specific risk profile and invests in a carefully constructed blend of asset classes. Smartfund is available in three different currencies (GBP, EUR and USD). The three Smartfund risk-graded strategies will be exposed to everyday stock market movements - they are not protected from losses due to volatile market movements but retain all the gains in a rising market. The Smartfund 80% Protected funds are protected to 80% of the highest value they have achieved, a “high-watermark” strategy. As a result the Smartfunds exposure to its investment strategy can change daily based on market conditions. Smartfund 80% Protected provides an extra layer of comfort for clients who prefer more security for their investments. 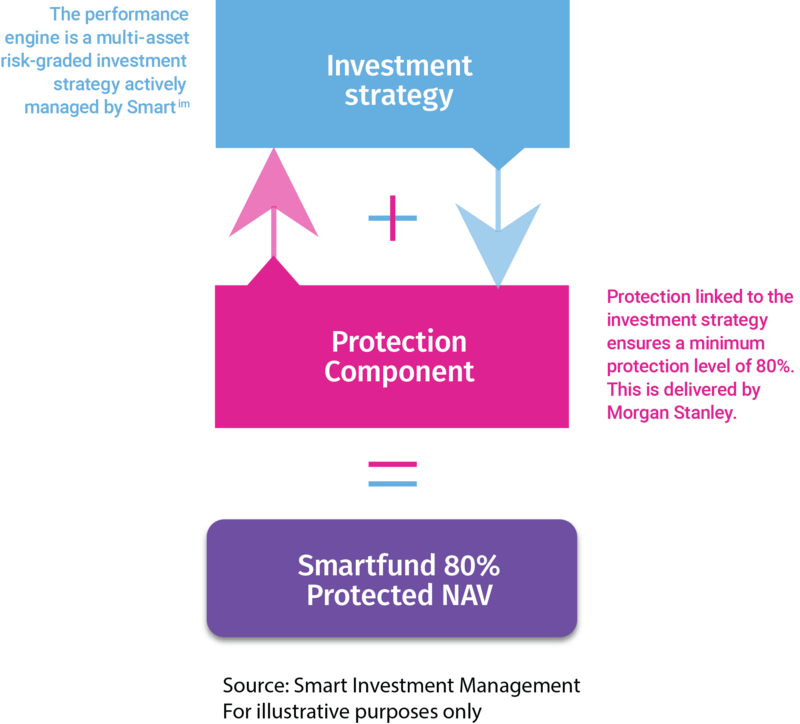 These capital-protected funds are made up of two parts: the protection component provided by Morgan Stanley, and the risk-graded strategy managed by Smartim. The protection component ensures that at all times the fund price is 80% or more of the highest fund value ever achieved. Gains made above the previous highest fund value are locked in, thereby continually increasing the protected level. The world’s leading financial advisers, investment managers, institutions, accountants and product providers use Praemium to manage or administer over $100bn (£59bn) worth of investment globally across more than 475,000 accounts. Established in Australia in 2001, Praemium has grown to be a market-leading provider of managed account platforms, investment management, portfolio administration and CRM solutions with offices in Australia, the UK, Jersey, Dubai, Armenia, Shenzhen and Hong Kong. For more information visit www.praemium.com. Smart Investment Management Ltd (Smartim) are the sub-investment managers for the risk-graded strategies at the heart of the Smartfund range. Smart is directly regulated by the FCA and is an authorised investment management company based in London. Smartim is a wholly owned subsidiary of Praemium, a global company with offices in Australia, the UK, Jersey, Dubai, Armenia, Shenzhen and Hong Kong. Both funds are designed to allow you to grow your capital, but the investment journey will be different for each fund as markets rise and fall. Investing in Smartfund may afford you a slightly better return in the long term, whilst an investment in Smartfund 80% Protected will protect you from the worst of the stock market waves along the way. You choose which is the right route for you. This chart illustrates how Smartfund and Smartfund 80% Protected might perform in different market conditions. 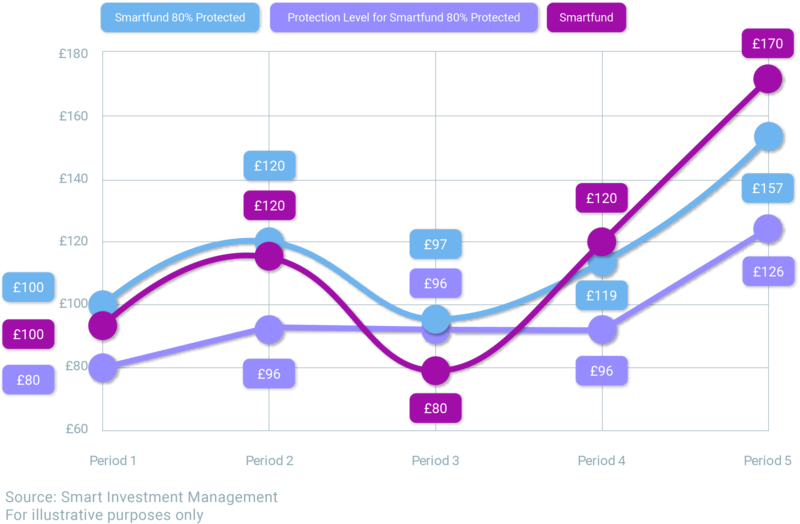 In this example, at launch one client invests £100 into Smartfund (the purple line) and £100 into Smartfund 80% Protected (the blue line). The protection level of the 80% Protected fund is illustrated by the lilac line.